It’s Holi and the colour is in the air! 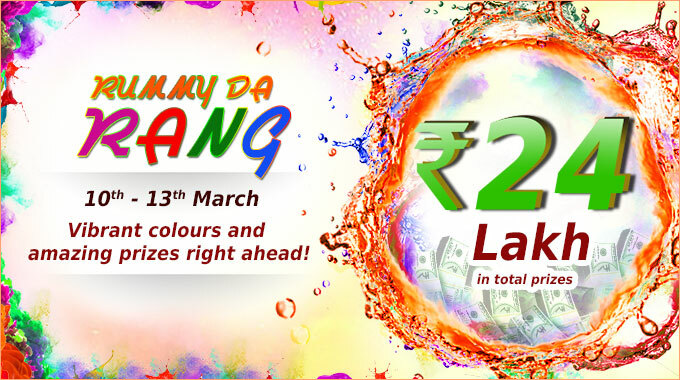 Rummy Circle has come up with an amazing bonus for the entire week of Holi. Rummy Circle makes sure that they do not miss any of the special occasions that matters to their players. The latest promotion from Rummy Circle is known as Rummy Da Rang and the players have access to a wide range of bonus and tournaments. The special bonus is one among the 4 special promotions which is a part of the Rummy Da Rang at Rummy Circle. You can start your splash of Holi colours with the special bonus. The special bonus is valid for the club members who are planning to make a deposit in the Rummy Circle website in the promotion period. The special bonus promotion is scheduled to be live from 10th March to 13th March. Club members can avail a bonus of 20% from this special promotion. The maximum bonus limit varies with the club level. Please find bonus details below. So if you are interested in the special Rummy Circle promotion. Go ahead and deposit the money in your account and utilize the special deposit bonus. Please do let us know your reviews on the promotions and tournaments that are hosted in Rummy Circle.